Women of the working class were the first to suffer the brunt of the crises. They were the first to be laid off when factories closed down or went bankrupt and had to suffer lower wages and difficult flexible working conditions when hired. Peasant and indigenous women who are the world’s number one food producers have become the world’s poorest facing unprecedented hunger and poverty as transnational corporations, local landlords and governments rush to steal away millions of hectares of lands for corporate farming, mining, infrastructures, dams, tourism and military use. They are dislocated and dispossessed from their lands, communities and way of life. Resistance against imperialist greed are met with violence and repression. The capitalist countries led by the United States wage wars of aggression and occupation in Asia, Africa, Latin America and the Middle East. They collaborate with repressive and corrupt regimes to curtail the fundamental rights and freedoms of the people. They impose anti-terrorism and counter-insurgency measures that target progressive and resistance movements in which women play active roles in the defence of rights, land, livelihood and freedom. States also tolerate reactionary practices and violence against women, such as femicide which has been on the rise in some countries in Latin America and Africa. The crisis awakened and heightened the spirit of resistance among the oppressed women of the world and taught them the need to break free from the chains that bind women to historical oppression. Either through organizing communities or joining national liberation movements, women are at the forefront of every struggle for rights, survival, freedom, justice and peace. Women workers are joining strikes and marches to demand for decent work, higher wages, better working conditions, job security and workers benefits. They initiate actions calling for the protection against discrimination in the workplace and asserted their right to unionize, peacefully assemble and seek redress for their grievances. Rural women organize themselves and led campaigns against transnational corporations, landlords and land grabbers. They organize petition signing, consultations, international investigations, missions and tribunals and wage land occupation campaigns to assert their rights to food, water land and other productive resources. In capitalist countries, massive protest actions are being launched against austerity measures and the corporate greed of the 1% to the detriment of the 99%, by a movement for economic justice and social change popularly known as the Occupy Movement. Tens of thousands of women of all ages, color, background, culture and religion have joined these actions which spread across the US, Europe, Asia and the Pacific and the Americas. In the Middle East and North Africa, women not only participated but took leading roles in the demonstrations and actions that ousted the fascist and corrupt rulers subservient to the US. The Arab Spring provided an opportunity for women to challenge the old system based on patriarchy, fundamentalism and other reactionary values that bind women to exploitation, discrimination and abuse. Women are breaking away from the chains of patriarchy and fundamentalism. They are conducting consciousness raising campaigns and demanding recognition, promotion and protection of women’s human rights including their reproductive rights and the right to choose their sexual orientation. They are asserting women’s spaces in all spheres of life. Women the world over are resisting war and occupation, of which they, together with children, are the main casualties. Women are organizing and joining solidarity and protest actions against US war in Afghanistan, Iraq and Palestine, and against militarization in many parts of the world. More and more women are participating in the people’s resistance movements attesting to the necessary and indispensable role of women in the struggle for national and social liberation. This March 8, the International Working Women’s Day, let us celebrate 101 years of women’s struggles and resistance. Let us assert women’s role in the fight for rights, justice, freedom and peace. Let us spark the fire of inspiration for all the exploited people of the world to resist imperialist crisis and war. Let us reaffirm our commitment to the struggle for national and social liberation and women’s emancipation. 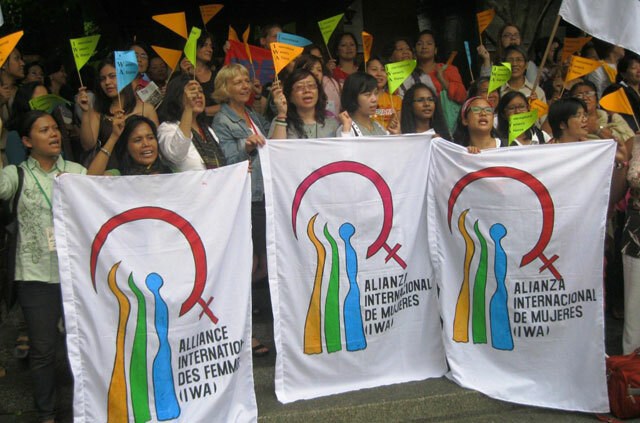 Express support and solidarity with fellow members of IWA and other women’s organizations in their local IWWD campaigns. ← Stop crackdown of SPARK! Stop construction of US naval base in Jeju Island!